Do you offer professional cryptocurrency and investments consulting services? Are you an ICO Advisor? 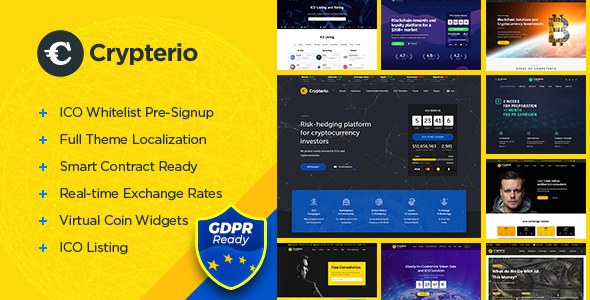 If you are an expert focused on the cryptocurrencies or Bitcoin trading and Investments, Crypterio WordPress theme will help you drive your services. Download today The Best ICO WordPress theme! Crypterio is ready for a Smart Contract and a Whitelist integration through CSV/XML compatible format to manage token distribution. With this unique feature, ICO participants can effortlessly and securely register, pass KYC/AML procedure, get approved, and get listed on a Whitelist to purchase tokens during the Initial Coin Offering. 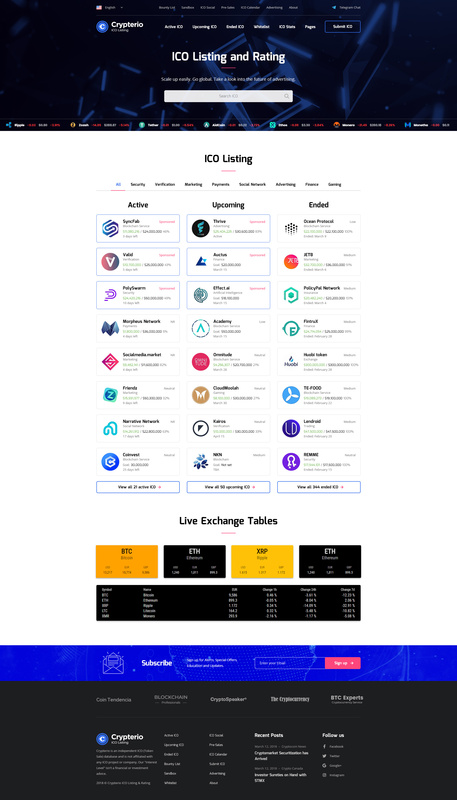 Just integrate your Smart Contract with a Whitelist through CSV/XML readable format to automate token distribution to whitelisted ICO applicants. Please note, the theme does not include a ready-to-go integration of a Whitelist with a Blockchain platform. You need to develop your own Smart Contract and setup its integration with the Whitelist feature in Crypterio. With Crypterio theme you’ll get a robust WordPress solution for an ICO landing page, and a professional website for ICO Advisor or Cryptocurrency Investments consulting firm. Blockchain technology consulting and ICO development agencies also can utilize the benefits and special features of the Crypterio WordPress theme. Get today The Best ICO WordPress theme! Crypterio WordPress theme is in tune with all devices, browsers, and platforms, retina ready and comes with Visual Composer as page builder for free. All customization options are available in the Front-End editor and no coding skill required to edit the existing content, improve it, remove it or add your customized blocks to a page. Now you’re ready to pack your professional website with high-quality content that will engage and inspire potential customers. Choose how you want to display your services and case studies, for maximum impact on your cryptocurrency business. A choice of templates, including custom pie charts, graphs and progress bars, gives you a range of dynamic and compelling options for showing your clients what you can do. With Crypterio WP theme the sky is only the limit! No need to be compromise of your Digital Currencies business ideas. Start your Bitcoin business today and hit the crypto market with an affluent website. Get today The Best ICO WordPress theme! Crypterio includes GDPR compliance plugin for managing user data, cookies, etc. Please do not hesitate to contact us on ThemeForest. If you face problems with this template, just send us an email. We can also customize this template for an extra charge.